The fact that you think you might be pregnant can either be exciting or terrifying, and those are only the beginning of the various emotions you might be feeling. 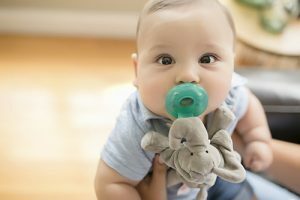 Those feeling can be different depending on whether you were hoping to become pregnant or you are being surprised by one of life’s unexpected turns. Being certain about whether or not you are pregnant allows you to begin getting a handle on whatever emotions you are having; the sooner, the better. 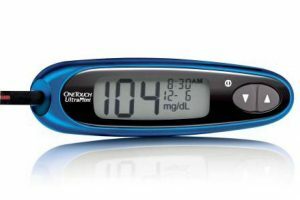 Before you spend your money on the first pregnancy test you see on the shelf or simply grab the one you’ve seen the most television commercials about, keep in mind that accuracy counts as much as speed. Finding the best pregnancy test can be a bit of a challenge given the numerous options out there, but we can help you narrow down your choice with our buyer’s guide and reviews of ten top pregnancy tests. 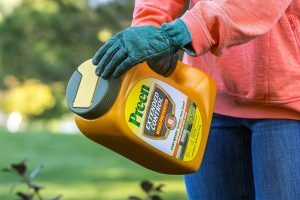 Using our buyer’s guide, you can make a much more qualified choice and select a better combination of speed, accuracy and value. Our ten reviews will allow you to compare the various features and benefits of ten top pregnancy tests in order to help you choose the right one as well. Let’s get started. When should you consider using a pregnancy test? Some women even get a sinus cold or sore throat infection from out of the blue when they become pregnant. If one or several of these conditions persists for more than a day or two, it’s probably time to get your hands on a home pregnancy test. However, be aware that you can play something of a waiting game in order to get the correct results. In fact, a true result might take several attempts over a period of a few days. Home pregnancy measure a hormone called human chorionic gonadotropin (hGC or HGC). The HGC hormone is produced whenever a fertilized egg attaches itself to the uterine wall. 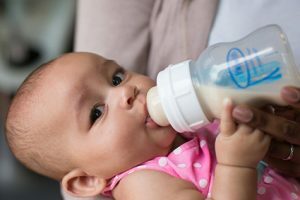 The production of this hormone increases in amount and concentration rapidly within six days after this event takes place. This hormone is typically what triggers the early signs we discussed above. HGC can be pretty accurately measured in your urine, but for complete accuracy, a blood test by a doctor might be necessary. How do you use a home pregnancy test? Fortunately, home pregnancy tests can be discreet, are pretty simple to use, and you get pretty quick and accurate results from them. 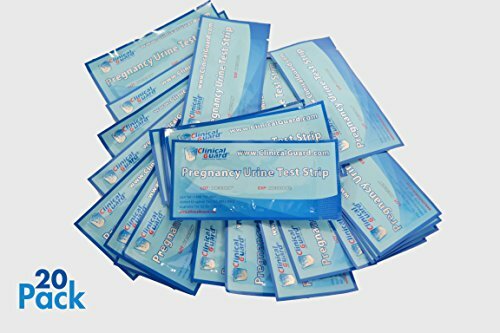 You will want to follow the directions included with the packaging for your specific pregnancy test and you want to make use of the test first thing in the morning when your urine is most concentrated. Depending upon the type, you will direct your stream of urine into a small cup, and then place the stick or strip in the cup or pour it over it. You will then want to set the test stick or strip on a flat surface and allow 3 to 5 minutes for the result to be produced. Just keep in mind that each test can work a little bit differently and accurate results can be compromised if you don’t follow the directions with the specific test you purchased. What features should you look for in a pregnancy test? • Clarity of directions. For obvious reasons, clearer instructions reduce user error and produce a more trustworthy result. • Ease of use. Nearly all tests are pretty simple, but some make it easier on you than others. • Simplicity of reading the result. You don’t need any confusion or guessing when it comes to knowing the answer to the most important question on your mind at that moment. The result needs to be crystal clear in order to leave no doubt. • How quickly you get your result. You’re going to wait 3 to 5 minutes on average. • How soon after fertilization can you obtain a result. The buildup of HCG takes some time, so earliest detection depends upon test sensitivity. Test sensitivity is measured in the minimum amount of HCG can be detected for each milliliter of urine. The lower this number is the more sensitive the test. 100 miU/ml is not very sensitive, but 5 miU/ml would be extremely sensitive. The vast majority of tests are in the 20 to 20 miU/ml. Each of these factors plays into determining which home pregnancy tests are considered the best. There is one more factor to take into consideration in our modern age. In truth, both of these types of home pregnancy test have been proven to be accurate whenever you correctly follow the instructions included with them. There are really only two distinguishing factors to separate them. Digital tests tend to be easier to read, but they also tend to be more expensive. That’s the long and short of it. With the information you’ve just been given concerning home pregnancy tests, you should have enough general information to know when to use a test, how they work, how to use them and what factors to keep in mind when selecting the right one for you. Keeping that information in mind, let’s examine ten top pregnancy tests in the review below. ClinicalGuard HCG Pregnancy test strips are quick, easy, accurate and sensitive. These are test strips that are dipped into a container of urine for testing. The control and result of these strips are very clear and easy to read and their sensitivity is 25 miU/ml. As simple as pregnancy tests are, when a person is anxious, they tend to make mistakes. With these strips, you’re not shelling out a lot of cash for each one, so an error in following instructions isn’t as big of a deal. In addition, one or two pregnancy tests can still be wrong, but three to five will eventually arrive at the correct result. These aren’t quite as clean and handy as the hard-stick types and they are a tiny bit less sensitive than the higher end tests. You are actively trying to get pregnant, because you can run through a ton of them without spending a lot of money. If you aren’t thrilled with dipping a test strip in a cup of urine, you won’t like these. 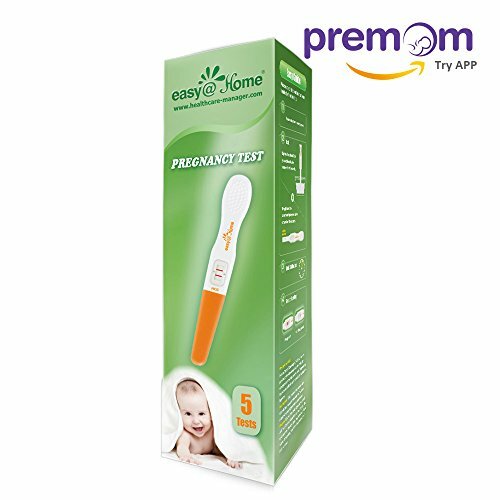 When it comes to user friendly home pregnancy tests, few beat out the Easy@Home Pregnancy test. To use this test, you simply urinate on the absorbent pad of the test stick for 10 seconds and then wait three to five minutes for the result. 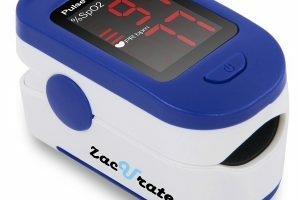 These tests are rated as being 99% accurate and have 25 miU/ml level of sensitivity. You do not need to collect your urine in a cup and then dip a test strip into it with this test. These are well designed for comfort and accuracy. You don’t shell out a lot of money for several of these tests either. Aiming a steady stream on the test pad for 10 seconds can be a challenge, because 10 seconds is a lot longer than you think. You are uncomfortable with collecting your urine in a cup and want an accurate test that doesn’t break your budget. You may not be as happy with this test if holding a stick under your urine is uncomfortable. For those who are more comfortable collecting a urine sample and using a test strip, Easy@Home makes urine test strips. These test strips are a bit more rigid than typical paper strips. They are simple to use and easy to read after just 3 to 5 minutes. Their accuracy is also 99% and their sensitivity is at 25 miU/ml. These strips are longer and more rigid which makes for a little bit more comfort when dipping the strip in the urine. You have plenty of test strips for errors and for confirmation in this test kit as well. These tests are not as quick and easy as the stick types and can be a bit less sensitive than a higher end tests. You are trying to conceive and want additional confirmation of results at a more economical price. You will be disappointed if you want a very clear, very early test result. Early clear and accurate midstream tests that are easy to use and easy to read are to be found in a package of One Step Early Detection Tests. These strips have a sensitivity of 10 miU/ml and 99% accuracy. These are midstream test that can be used up to 4 days earlier than standard tests. 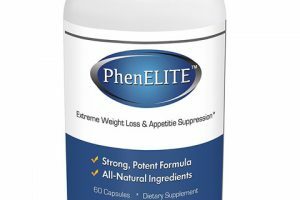 Because of their excellent sensitivity, these sticks can give you the earliest possible detection results in an over-the-counter product. They are quick and easy to use and the results are pretty simple to read. In addition, these are full-sized tests rather than mini sticks. You also have plenty of extras for instructional errors and results confirmation. These tests can be a little dim when used really early and they can be a little stubborn with producing results as well. You want the earliest detection possible with plenty of backups and you don’t want to break your budget. If you aren’t at all worried about how quickly you find out, you can find more economical packages for less money. More than forty years of experience are built into the quality and accuracy of e.p.t. Early Pregnancy Tests. You can use this test mid-stream (for only 5 seconds) or test in a cup of collected urine. Results can be seen within 2 to 3 minutes with 99% accuracy. You get a very clear +/- result and the sensitivity rating on this test is at 20 miU/ml. 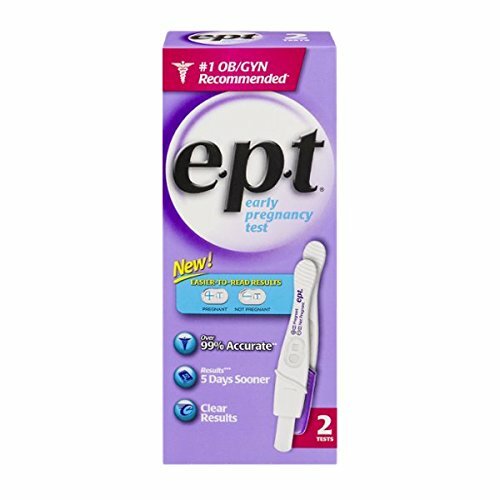 Dependability and early detection are a part of what makes the e.p.t. tests popular and most often recommended by O.B. Gyns and pharmacists. The results are pretty clear to read and these tests are easy and convenient to use as either a midstream or dip strip. You only get two tests, so user errors are a greater risk as are invalid results. Their early accuracy over other tests is marginal. You want to go with a well-recognized name brand product to be more confident in the result. You might not be entirely pleased with the early detection results. Rapid results with plenty of accuracy and ease of use can also be had from Preview Pregnancy Tests. These are also easy to use mid-stream sticks that come in a two pack. Their results are 99% accurate and you get a very clear and easy to read result, which you can have within three minutes. Where mid-stream tests are concerned, these are pretty economical to purchase. They are pretty accurate, easy to read and convenient to use. There is some question about the sensitivity of these tests for early detection. Again, two sticks make user error and invalid results a greater risk. You want a budget priced mid-stream test and early detection is not critical. Those who are looking for early detection cannot be sure of the accuracy of this test. 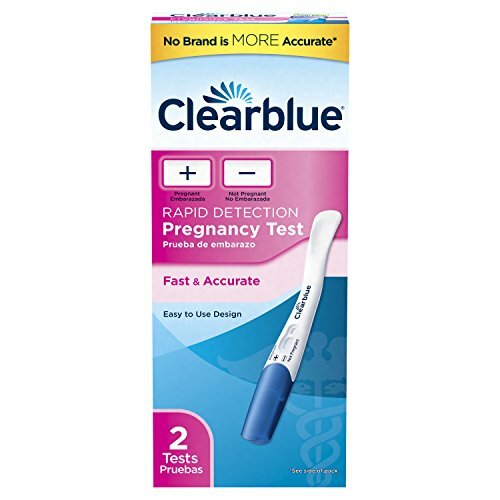 Easy to read results in a more ergonomically designed testing stick are two of the standout characteristics of Clearblue Plus Pregnancy Tests. These tests deliver a very easy to read +/- result in the indicator window. The stick is shaped in such a way that it is much easier to use than most mid-stream tests. You get your results as quickly as three minutes and its sensitivity is 25 miU/ml. The shape certainly makes this a mid-stream test to pay attention to. That little bit of curvature in the stick makes a world of difference when you are trying to hold the test stick in place for an accurate test. These tests also show a very clear and accurate result in the test window within 3 minutes. These tests are not going to supply any earlier detection than your average test. Evaporation issues seem to be a bit to frequent. Risks are higher for user error and invalid results with only two sticks. You want the additional reliability of a brand name test, but don’t want to pay a lot of money. If you’re hoping for an earlier result than the typical test, you need to try a different test. 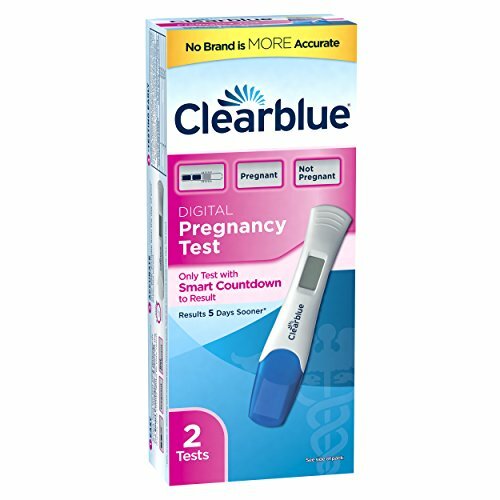 If you’re ready to move into the digital age with your pregnancy test, then the Clearblue Digital Pregnancy Test is where you want to start. The accuracy of the smart countdown digital technology of this test is second to none. You get a very clear text result with the words “pregnant” or “not pregnant” in the display. These tests are 99% accurate, as easy to use as a regular, mid-stream stick test. No more trying to read lines. The clarity of the result of this test is certainly something to point out as a major positive and a good reason to go digital. The price of this digital test is negligible when compared with analogue tests. You won’t get any earlier results with this test than with other standard tests. Two sticks is quite a risk to take when it comes to human error or invalid results. You want to jump into the digital age with your pregnancy test and want to read your result in text rather than trying to read lines. If you’re looking for an earlier result, you’re just not going to get it with this test. Those who are trying to conceive often make use of test for both fertility and pregnancy and this Wondfo combo pack helps with that. These are test strips that are dipped into a cup of collected urine to detect best ovulation periods as well as pregnancy when it finally occurs. These are 99% accurate tests with easy to read results, easy to follow instructions and sensitivity of 25 miU/ml. Since ovulation and pregnancy tend to go hand in hand, the convenience of this package is certainly something to keep in mind if you’re working on getting pregnant. The combination of the two in test strips provides you with a very economical option. These test strips are a little less user friendly than mid-stream sticks. You will get your results no faster or earlier with these tests. You are in the process of getting pregnant and want the combination of best ovulation and pregnancy in one economical package. If you aren’t interested in the ovulation tests, you won’t be happy with the combo pack. 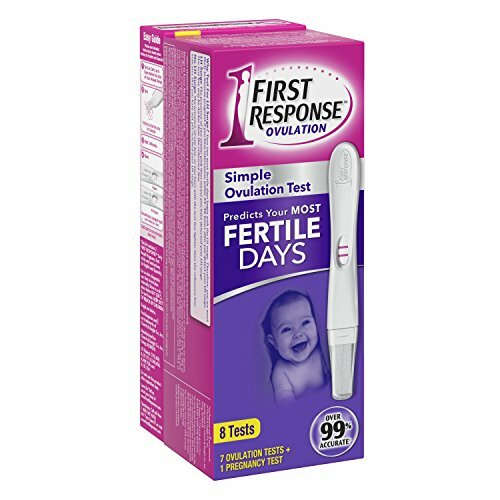 First Response also provides an ovulation/pregnancy test pack in the form of a mid-stream stick. The ovulation tests provide you with the best 2 days each month to get pregnant and the pregnancy test gives you the earliest possible results among mid-stream sticks with 99% accuracy. The sensitivity level of these tests are rated at 6.3 miU/ml and they provide you with a very easy to read result. 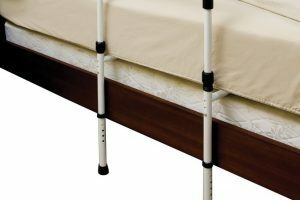 This combination package of mid-stream sticks is both convenient and helpful for those who are working on getting pregnant. The sensitivity of these tests is the highest of all tests at 6.3 miU/ml, which allows you to test up to six days earlier than you might test with other tests. In addition, the mid-stream tests are somewhat simpler to use than test strips. You’re going to pay almost 3 times as much for the convenience of mid-stream sticks and get fewer tests than with strips. The limited number of sticks put user error and invalid results at a higher risk. You are in the process of getting pregnant and want the convenience of both mid-stream tests and a combo pack of pregnancy and ovulation tests. If you aren’t interested in ovulation tests, then you need to consider purchasing the pregnancy tests separately.